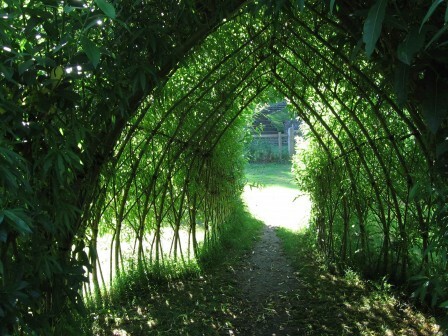 Willow’s special properties are used to create living structures ideal for the garden, school and community projects. Willow rods root easily if pushed into the ground from autumn to early spring and can be bent and tied together to produce domes, tunnels and latticed living fences. Willow grows very quickly and will need maintaining each year. Care should be taken when positioning your willow structure to avoid drains and buildings. Contact your local coppice worker for advice and supply of materials.